Last week, I was lucky enough to stay in a cabin at the Plattekill Falls in the high peaks of the Catskills. Several years ago, I received an artist’s grant to stay at the falls to work. This year my husband received the grant to pursue his writing and I got to go along for the ride. The falls are truly magnificent. There is a long plunge over the cliff that produces an elongated and sublime fall of water. Sometimes there are 2 distinct falls, sometimes one big rush. During the month of August where there is usually very little rain, there was one more pronounced fall with a smaller more diffuse fall to one side. All very poetic. One can hear the falls continually from the cabin. Even in one’s dreams, the hum of the falls is there. From the upper windows of the loft, where one sleeps, you can look out and see the chasm, the space of the plunge. A deeply reflective place in which contemplation is a natural outpouring of such solitude. I have been to these falls on several occasions beyond the time of my own grant. The vantage points in which I have painted the scene have been primarily from below where one receives the full visual impact of the water cascading down. This time, I tried to focus on something else. I was profoundly interested in the space created by the falls. In many ways, it feels like a very special room, like a room in a cathedral. There is a sense of the vaulted sky above that you cannot see, but is ever-present in the blue reflected light on the rocks and leaves of the surrounding trees. There is also a feeling of a room because the rock that surrounds the lower falls is curved. As the light enters the narrow clove, it travels from the left side progressing slowly throughout the day to the right side and leaving the room about 3 in the afternoon. The narrowness of the clove produces this shaft-like effect and is reminiscent of a high window in a cathedral as well. This feeling of immensity and sublimity of space was in my mind while I worked. I also had some artistic goals as well. Over the years, I have been interested in the Japanese method of creating space and drama. This method uses an obstruction in the foreground to create a feeling in the viewer that desires to see around the near object and look into the space beyond, whether it is a room or a vast landscape. This method was employed by many 19th century artists most notably Degas and Van Gogh. But also by American landscape artist such as Edward Redfield and Arthur Wesley Dow. So my idea, in order to capture that feeling of a room, was to employ some of these techniques. 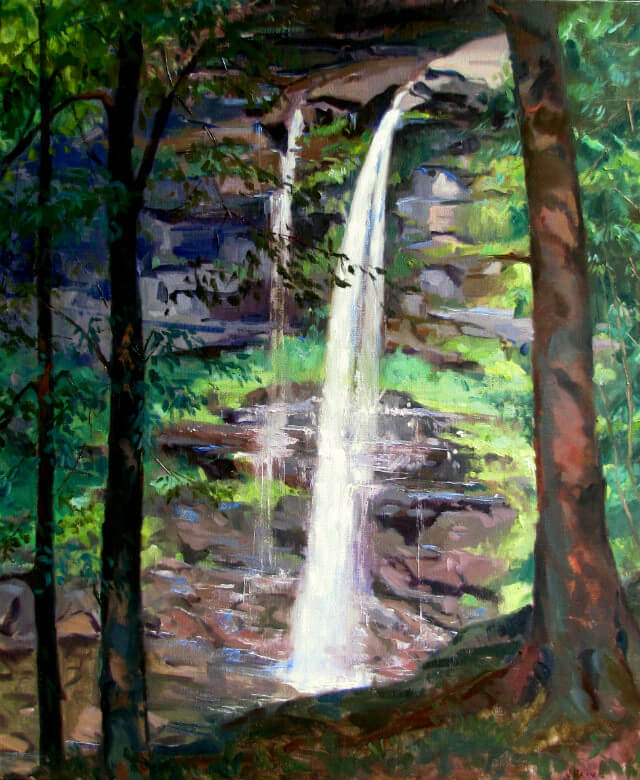 In my largest canvas, 36″ x 30″, I chose to view the focal point of the falls through 2 trees. These trees would frame as well as obscure the view creating a feeling of another wall to the room. And this near wall would provide the viewer with that desire to look around and into this sublime space. I wanted to capture the feeling of coming through the woods upon a scene that calls for respect and awe and that feeling of “hush-ness” that great architecture produces upon the soul. I also wanted to create a sensation of depth between the near “wall” and the falls. I employed an intervening branch to give this added feeling of depth. I strengthened these ideas with a compositional technique of rabatment. One can look to a previous blog for reference on this method. Lastly, I was also interested in color. I have employed the color theory of H.G. Maratta and of Robert Henri in my work since 1994 and have written quite extensively on this subject in my blog. One of the aspects to this theory is to develop one’s color through a triad based on a musical chord. The music part is less important than the working in a specific triad that gives a distinctive feeling of a “key” as in music. This key, or triad, becomes the basis for the palette and replaces the primary colors. One treats these colors as the primaries, R-Y-B in a normal palette and mixes as one needs to achieve the effect in nature. But what gives these colors such beauty is their specific intervals along the color spectrum. So these triads are based on major or minor chords as well as dominant 7ths, tonic chords, dominant chords or sub-dominant chords in any key. For this painting I used the chord of YG-BV-R (F Major). These colors are at 1-3-5 intervals and reflect a major chord. So if I begin the full spectrum with the YG(yellow-green) with this color as 1. If one looks carefully, the Red appears in all three intensities and binds the chords together. In my mid-sized painting of the falls, 30″ x 24″, I employed the same color relationships, but even in a more minimal way since the foreground is more sparse. But any method is not a pure medium. I still had to account for those blue reflected lights and could not get them right until I added some ultramarine blue plus white to achieve the necessary effect. You can take a theory to its fullest to get the over-all effect you want, but sometimes you need to be flexible to make the specific image you are working on function at its best. I had a full week hiking up and down the clove as well as experimenting in color and composition and more importantly living in the profundity of the moment.